Body parts don’t give up when they’re overworked or tired, so much as they just keep working until they give out. The gluteus medius and minimus muscles in the buttocks are no exception. When overworked, these muscles react by becoming tight, going into a constant state of contraction in order to perform their job, similar to a student staying awake all night to cram for an exam.Eventually, however, the work catches up. They become exhausted and can’t perform as well, or become limited in what they can do. When this happens, people can develop gluteus medius muscle syndrome or gluteus minimus muscle syndrome. Because the two muscles are so anatomically and functionally related, healthcare practitioners often refer to either syndrome as gluteus medius/minimus muscle syndrome.People with this syndrome often describe their pain as a deep, dull ache in the buttock that often radiates to other areas of the body. 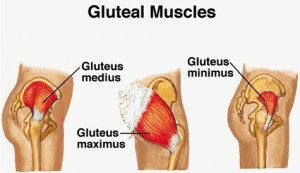 A number of things can cause or contribute to tight gluteus medius or gluteus minimus muscles. Muscle imbalances, poor posture and poor spinal or foot mechanics can be a factor, as can anything that overworks the muscles. When overworked, the muscles develop minor strains, which causes an inflammatory response. This inflammation is what causes the pain.ne the level of this pain, however. Instead, people with the syndrome often feel the most pain when they’re startled or make sudden movements. Because excess work can cause the syndrome, it’s very common among runners, who use these muscles extensively. But runners aren’t the only people susceptible, as generally anyone who is active and overuses their gluteus muscles can be affected. For this reason, it’s important for people with gluteus medius/minimus syndrome to avoid activities that put pressure on the gluteus muscles until their healthcare practitioner says it’s okay.